Richard L. Schwab’s experience in education has spanned four decades, beginning with a job in Chelmsford, Mass., as an eighth-grade history teacher. He went on to earn both a master’s degree and doctorate in Educational Administration at UConn, before spending 10 years on the education faculty at the University of New Hampshire. He spent the next eight years at Drake University in Des Moines, Iowa, where he served three years as head of its Department of Educational Administration, and then five years as dean of the School of Education. In 1997, he returned to his alma mater to serve as dean of the Neag School of Education. Dean Schwab served 12 years as dean from 1997 to 2009 before returning to the faculty as a Raymond Neag Endowed Professor of Educational Leadership. In July 2014, he returned as dean to lead the Neag School in implementing the University of Connecticut’s New Academic Plan. With his return, Dean Schwab is the longest-serving dean in the history of the Neag School of Education and the only UConn alum to hold that position. During his 12 years as dean, Dr. Schwab worked with faculty to craft and implement two strategic plans to raise the quality of programs, research and scholarship, while moving the school toward its goal of becoming one of the top education schools in the country. The effort sparked the interest of Ray Neag, an UConn alum and successful entrepreneur, who decided to make what he called a “strategic investment” in the school and in public education. His $21 million gift in 1999 was, at the time, the largest any school of education had ever received, and today remains the largest in UConn’s history. Dean Schwab’s commitment to education reaches the national, regional and international levels. 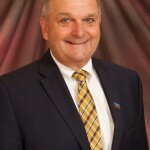 He is a member of the American Association of Colleges of Teacher Education and has chaired several important committees including the Annual Meeting Program Committee and Research and Information Committee. He has taught in AACTE’s New Deans Institute and is past president of AACTE’s Connecticut chapter. He serves on the National Commission on Teaching America’s Future and has been elected to its board of directors. He is past president of the Council of Academic Deans for Research Education Institutions and has held leadership positions in numerous state and regional education organizations. He has served as president and held several other offices of the Northeastern Educational Research Association. Internationally, he has served on the Quality Assurance Team for Teacher Education in the state of Qatar and worked with universities in the United Arab Emirates, Russia, Ireland, South Africa and Saudi Arabia on educational reform issues. At the state level, Dr. Schwab has served on a task force appointed by the Legislature to overhaul the Connecticut Beginning Teacher Assessment process, as well as served on a number of statewide committees focused on school reform. He is a founding member of the Connecticut Alliance for CommPACT Schools, a historic collaborative involving the state’s two teachers unions, the three organizations representing school administrators and superintendents, and UConn’s Neag School of Education. Dr. Schwab has held a wide range of university-wide leadership responsibilities at UConn. He recently chaired the University Academic Vision Committee that designed and produced the five-year strategic plan for the university entitled Creating Our Future: UConn’s Path to Excellence. He is an elected member of the University Senate and has served on such important Senate committees as the Faculty Review Board and Committee of Three. He has chaired searches for a number of administrative posts, including the Dean of the School of Business, Dean of the School of Agriculture and Natural Resources, Dean of the College of Continuing Studies, Vice President and Chief Operating Officer and Associate Vice Provost. He led the effort to expand technology capability and use across campus to enhance student learning, and co-chaired the University Master Planning Committee. As recognition for his work in engaging the university in Connecticut and the nation, he was presented with the Provost’s Award for Public Engagement. Over the years, Dr. Schwab has researched, presented and published on issues related to teacher preparation, teacher and administrator education reform, educational technology, and occupational stress and health in educational organizations. Most recently, he collaborated with Neag faculty on the book, Portrait of a Profession: Teaching and Teachers in the 21st Century, for which he served as co-editor. In recognition of his outstanding research on teacher education, he was presented with the American Association of Colleges of Teacher Education Margaret Lindsey Award for Distinguished Research in Teacher Education. In 2006, he was honored by his undergraduate alma mater, Boston University, with the Ida M. Johnston Award for Outstanding Achievement and Service and, in 2008, received an award for Outstanding Service and Support from the Neag School of Education Alumni Society. His awards from research associations include the Leo Doherty Award from The Northeastern Educational Research Association for outstanding leadership in educational research and the Outstanding Scholar Award in Occupational Stress and Health from the American Research Association. Moss D.M., Glenn, W.J. and Schwab R.L. Eds. (2005) Portrait of a Profession: Teaching and Teachers in the 21st Century. Praeger Publishers, Westport, Connecticut. “Building a Viable State Association for Colleges of Teacher Education” symposium participant at the Annual Meeting of the American Association of Colleges of Teacher Education. Washington, DC. “What Education Researchers Want to Know About Student Learning and What Policymakers Want to Know about Student Learning: Are We on the Same Page? “Managing Change in Higher Education” invited presentation to the Carnegie Corporation’s Teachers for a New Era conference on Reform in Teacher Education, San Francisco, CA. Schwab R.L., DeFranco, T and McGivney Burrell J. (2003) Preparing Future Teacher Leaders: Experiences from the University of Connecticut’s Five Year Teacher Education Program, Educational Perspectives, November, 36, 1&2. “Educational Implications of the National Evaluation of the Comprehensive Community Mental Health Services for Children and Their Families” Discussant, Northeastern Educational Research Association Annual Meeting. Kerhonkson, NY. “Conducting Retention Studies in Teacher Education” Presentation to the Council of Academic Deans in Research Education Institutions, Santa Fe, New Mexico. Schwab R.L. & Foa L. (2001). Integrating Technologies Throughout Our Schools. Kappan. April, 82, 8 pp. 620-626. Schwab, R.L., (2000). Technology and the Changing Roles and Responsibilities of Teacher Educators. In Log In or Log Out: Technology in 21st Century Teacher Education. Switzer, T. Editor. AACTE Press, Washington D.C.
Johnson M., Schwab R. L., & Foa L. (1999). Redefining the Process and meaning of Teaching with Technology. Theory Into Practice. Winter, 38,1. WNPR: Are We Investing In Our Teachers?